At 4 a.m. on May 29, 1917, under the command of Captain John E. Woodall, while en route from Port Pirie, S. Australia to Belfast with a cargo of wheat, the vessel was torpedoed by UC 55, Oberleutnant zur See Theodor Schultz in command, 40 miles WxS of Fastnet At 50.57N, 10.21W. It was armed with just one recently installed gun. The Captain & the 3rd officer, A. G. Macpherson, were 'blown off the bridge by the force of the explosion'. The Captain recovered somewhat, stopped the engines, went below to destroy the code books & was never seen again. 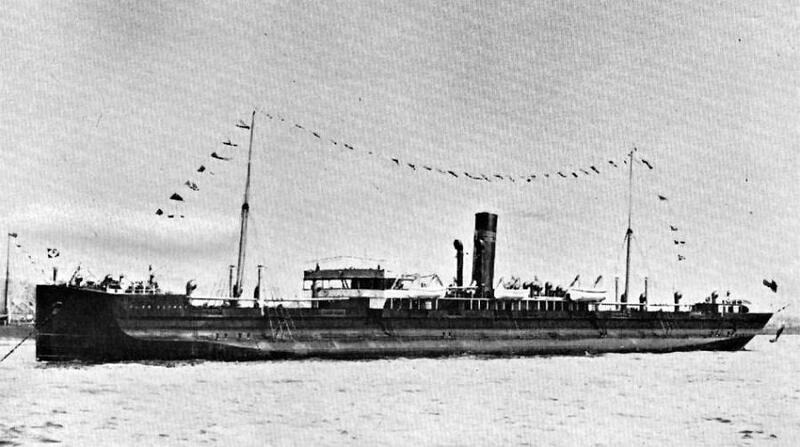 Macpherson was taken aboard UC 55, & taken to Germany as a prisoner. And maybe the 3rd Engineer. 64 persons died - nearly all on those on board.